College is the place where you’ll lose yourself before you find yourself. We’re desperate to be more than we’ve been, finally becoming strong and brave enough to tell the world what we stand for. Whether we speak it through a pen, shout it with our voices or let it be heard through music, we want everything we do to tell the story of who we are. We are striving to be unique, honest, bold, wise and incredibly beautiful –but how? How do we find a way to give the world all that we are? I’d do you a great disservice if I didn’t start off with the most basic advice possible: Try something new. Maybe it’s trite and simplistic, but it also happens to be among the most life-changing ideas in existence. There is no better way to discover the depth of your character than trying something you’ve never done before. There’s no harm done if you don’t like it, but if you do end up falling in love with a new experience, the course of your life may change. You can discover a secret talent or realize what you want to do with your life. Once you know all of the options available to you, you can choose the best fit. If you want to try out belly dancing, take a class; you may become the belly dancing queen of the world. Maybe it’s not dancing: It could be acting, painting, martial arts—anything that makes you feel free. Here’s something else I’m sure you’ve heard before: Don’t be afraid, be brave. We must be brave in both our attempt to find a way to express ourselves and in the actual expression. Don’t hold anything back. With everything I do, I pretend it’s the only chance I’ll ever have to do it, so I need to give it all right then and there. Life is too short and unpredictable; we have to take a chance while it’s in front of us before it’s too late. Once you finally know what you want to say and how you want to say it, go all in. Dance hard. Speak loud. Write more. Dream big. Let the world know it all. If you want to express yourself boldly without an audience, there are plenty of options. Dance in the solitude of your room or keep your paintings in a secret place. If you’re into writing but not ready for the world to know it, start an anonymous blog. This way, you’re expressing yourself without being watched by scrutinizing eyes. Expression is the gift that keeps on giving. 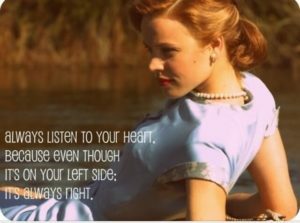 Cheers to this treasured and final bit of advice: Listen to your heart. The heart is the wisest human asset, and I’m not talking about the bloody muscle beating in your chest. The heart I speak of is your conscience, the loud voice in your head so often ignored. The heart can’t lie and it can never be wrong. When trying to find your creative outlet, you should always keep in mind the things you love doing. If you don’t love what you’re doing, why do it? It doesn’t matter if other people don’t like it or disagree; expression is all about doing something for yourself. It’s your freedom. Just keep your intentions good, your head up and your ears open to your heart. By the end of these four years, I hope I’ll have a pretty good idea of who I really am. I’ll always be courageous and open to new experiences, but I’ll never forget to listen to my heart first. I’m more than a student; I’m an artist. I think that each of us is, but we have different things to say and ways to say it. Whatever you have to say, shout it out.